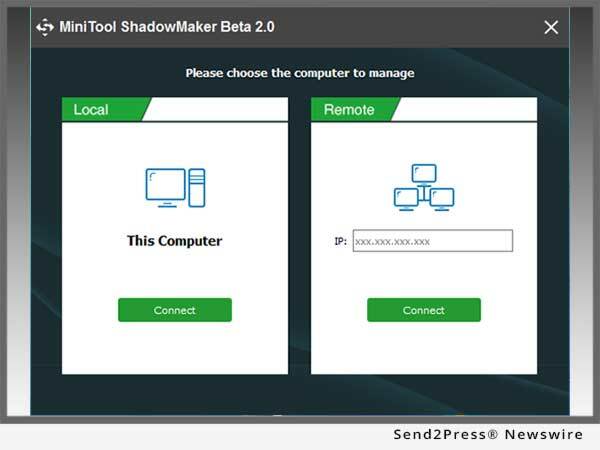 VANCOUVER, B.C., Canada, June 26, 2017 (SEND2PRESS NEWSWIRE) — MiniTool Solution Ltd. today announced the release of MiniTool ShadowMaker Beta 2.0 – a brand new yet professional data protection solution. MiniTool ShadowMaker Beta 2.0 is an all-in-one disk partition backup and disaster recovery solution for PCs. What can it handle? Well, no matter you need to back up Windows OS, selected partitions, and even the whole disk, you just turn to it. With a copy of backup, you are able to restore computer to a previous state once a disaster occurs, like system crash, hard drive failure, etc. It is FREE for home users now but does not support Windows Server. MiniTool ShadowMaker is capable of dealing with many backup tasks. As free backup software, this is indeed praiseworthy. Local/Remote Backup: enables to back up the local computer or remote computer in the same LAN. Backup System: Back up Windows system in case that some day it fails to boot. Back up Disk: Back up basic disk, including the system disk to make the most intact copy of your data. Schedule Backup: Schedule backup task and set to back up daily weekly, monthly or on event. Manage Backup: Manage backup tasks such as to add differential and incremental backups based on the former backups, to restore a backup image. Universal Restore: Restore Windows operating system to a bare computer or dissimilar hardware. In this way, you successfully avoid the tedious of reinstall OS and necessary applications. Bootable Media Builder: Create WinPE-based bootable media to restore system to a normal state when there is a need. Totally new interface, clear and intuitive. Separate Restore feature to the main interface. Automatically detect and add existed backup files to backup list in Windows and WinPE. Support inputting IP address and PC name to NAS path, and enhance the ability to check whether a NAS path is valid. The beta version is totally free for Windows home users. Those who are interested in the beta testing can never miss out. MiniTool Solution Ltd. is a software development company located in Canada. After years of development, now it has become a professional data care company, which offers multiple programs to help users resolve issues: its partition manager software – MiniTool Partition Wizard is effective in disk partition management; the data recovery software – MiniTool Power Data Recovery is devoted to recovering lost/deleted data due to various causes; and Mobile Recovery for iOS/Android are recent data recovery software solutions. Now MiniTool ShadowMaker is released to make up for the deficiency of disk imaging software. MiniTool Solution Ltd. is a software development company located in Canada. After years of development, now it has become a professional data care company, which offers multiple programs to help users resolve issues.